Today was a special day not just for the Islanders, but for Drive 4 Five. I was at the Coliseum announcement today covering the events, and I was able to speak with Jon Ledecky, Brett Yormark, as well as other executives and journalists and ask them questions about the big move! When I arrived, I had to sign in, and on the sign in sheet was the New York Post, New York Times, NBC, NHL, and yes, Drive 4 Five. It was an honor to be apart of such great company for such a historic day and it was a proud day for this website. In case you have not heard yet, the New York Islanders are coming back to the Nassau Veterans Memorial Coliseum! The Islanders will begin playing 12 games at the Coliseum next season, and will continue to play half of their home games the two following seasons. This will be the arena situation until the new Belmont arena is built in 2021. Belmont will include an 18,000 seat arena, an entertainment district, a hotel, retail village, improved train station, etc. Until then, the New York Islanders can call Nassau Coliseum and the Barclays Center home. It was no surprise that the New York Islanders wanted to leave Brooklyn. Second-class treatment, poor sightlines, bad attendance, and the difficult travel made the move to the Barclays Center in 2015 an inevitable flop. Fans, including myself, vowed to controversially boycott the Brooklyn move in an effort for the Islanders to come back to Nassau County. Since the move to Brooklyn, the New York Islanders have been second-to-last and last in attendance, and are last in attendance this season, right below the Carolina Hurricanes. 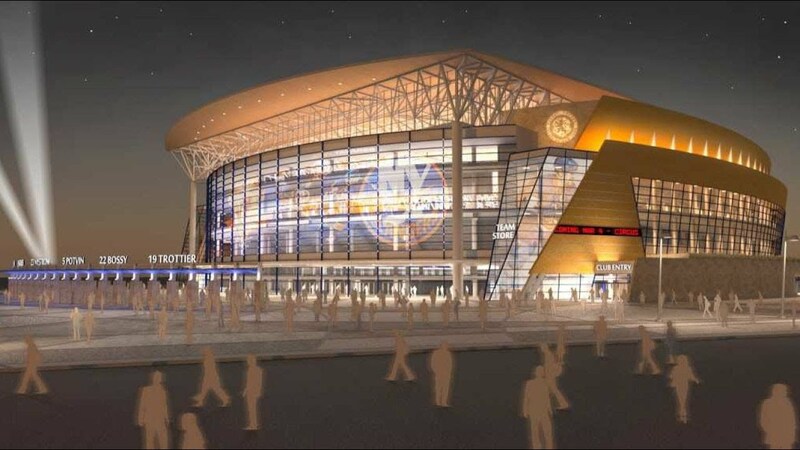 The Barclays Center began to lose money in supporting the New York Islanders. However, during the Stanley Cup Playoffs two years ago, Islanders fans made the trek to Brooklyn to support their team. Jon Ledecky knew we were here, and he knew the fan base was a strong one. It was just that no one would go to Brooklyn unless they absolutely had to! Before the new Belmont arena is completed in 2021, the New York Islanders will split time in Nassau County and Brooklyn. Starting next September or October, the Isles will play twelve games at the Nassau Coliseum and the two seasons after that will feature a complete split of home games between the Barclays Center and Nassau Coliseum (all preseason games will reportedly be played at the Nassau Coliseum). The Barclays Center and Nassau Coliseum are both run by Brooklyn Sports and Entertainment Group. At the Coliseum, the group will make money and increase revenue. In Brooklyn, the Barclays Center lost millions of dollars. A few weeks ago, Gary Bettman and Bill Daly, NHL Commissioner and Deputy Commissioner, respectively, deemed the Nassau Coliseum unsuitable for NHL hockey. This past weekend at the NHL All-Star game in Tampa Bay, Florida, Gary Bettman stated, “The Nassau Coliseum has been given a refresh, in terms of the way it looks. But it’s still the Nassau Coliseum.” Due to this factor, the Coliseum will undergo minor renovations to fit the needs of the Islanders and the National Hockey League, which will be paid for by the state of New York. Yormark also stated that he encourages the team to play more games at the Coliseum at the press conference, meaning the ball seems to be in the Islanders court over how many games they will play in the old Barn. As of now, it is unknown as to how the games would be spread out at the Coliseum. Would it be the first half in Brooklyn and the second in Nassau? Would the games be divided up randomly? I asked Jon Ledecky how the following seasons would be formatted and he replied that, “the NHL will decide how the games are scheduled. I have no information or details about what will happen because it is all up to the NHL scheduling team and Gary Bettman. The information will come out once next year’s schedule is released.” I believe the Islanders should vary the twelve games next season, and afterward, divide the schedule into halves the following seasons. Once the 20th or 21st game is reached, the home arena will switch. There is no point for 41 games to be broken up randomly. The New York Islanders are back where they belong at the Nassau Coliseum. Even if it is short-term, 2015 will not be the last year that the Nassau Coliseum is home to Long Island’s favorite team. New York Islanders fans fought the ruling of the NHL and Brooklyn Sports and Entertainment of sending the Islanders to Brooklyn, and we won. The Barn will rock once more! Thank you for reading about today’s monumental day for the Islanders, Nassau County, and Drive 4 Five!